**This is a sponsored post written by me on behalf of GoodNites* TRU-FIT*. The opinions I have expressed are my own. I am disclosing this in accordance with the FTC Regulations. Mclachlan, my five year old has been potty trained since the age of around 2 years old. It was rather simple for us because he really liked sitting on the potty. As he got older he went through a stage of "accidents" but overall the experience was easy compared to most families. Then he started school full time and "bed wetting" started happening frequently. I was rather concerned at first and looked to his Doctor, family, friends for some answers. "More than 40% of parents find it frustrating and feel that bed wetting can be “trained” out of a child. But in fact bed wetting is a fairly common medical condition that a child cannot control or be trained out of". I wish I could say I am a perfect parent but at first I was one of those 40% who though it was his fault and he needed more potty training. “According to a GoodNites® brand study, it’s estimated that 1 in 6 children between the ages of 4-12 in the United States suffer from nocturnal enuresis, more commonly known as bedwetting” Giving your child support is the main thing if they have an accident. They don’t even realize this is happening. This is not something that can be “trained” out of them. I made that mistake but quickly realize this is something we can get through together as a family. I invested in bed pads to help and took to the stores for a better alternative to "diapers". 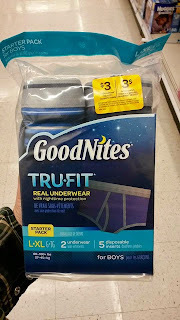 We found these GoodNites* TRU-FIT Underwear. They are machine-washable with disposable, absorbent inserts! How excited was my five year old to now have something that looks just like his regular underwear but provides protect against his sheets and PJs at night. 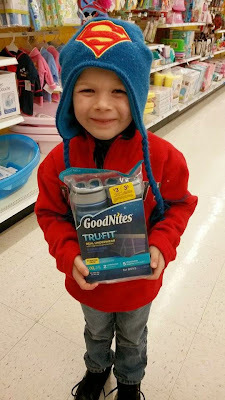 I was surprised to see that the GoodNites TRU-FIT disposable inserts did not need any sort of sticky backing, they simply fit and stay.We purchased ours at Target and they are made for both boys and girls. They come in the sizes S/M & L/XL with different colors, patterns for each size. GoodNites TRU-FIT starter pack in-store was $18.99. But if you are interested I wanted to share a a $2 off coupon here. I know this is not a easy topic but it does happen and if you are struggling with this remember it is common. It is normal and they will grow out of it but it takes time, patience, and understanding. Trust me your child feels just as bad and guilty about it as you do! They probably hold guilt and resentment themselves because we are our own worst enemies so be kind. I don't have kids, but I will remember this in the future. Plenty of friends that have started having kids! 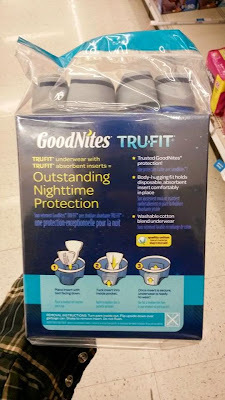 I always used Goodnites when my boys were babies. They were awesome. I used GoodNites with my Autistic daughter until she grew out with them. I've found they're the best quality of the overnight diapers. It's a big boy method of working towards nighttime dryness. This is great! Awww your son is so cute! and those diaper/pull up type of things are so cutee!! Oh these diapers are so cute. Love the camo print! I will definitely recommend this to moms. I've been dying to try these with my daughter. She is potty trained but still has trouble at night sometimes. My son has an accident only once every few months, but these look amazing! I would definitely recommend to any of my mommy friends whose littles are still having some night time trouble! We don't have that brand here. I commend you for successfully guiding and supporting your kid. It's great that she is potty-trained! I've heard great things! I will be buying these for my littlest man when it's time! What a cutie. I didn't use any of these types of things I just went the straight underwear route. We didn't have many accidents since I limited liquids after a certain time before bedtime. Such a cute little guy. My son actually wears them and they are great. Oh that is so cute and very unique print too. My daughters are in LOVE with these. They are the best products we have ever used for bedwetting. I couldn't believe they worked so well. I love these, we got something similar in SA. Bed-wetting can be embarrassing and uncomfortable without Good Night. These seem great! I love that you are taking the "supportive" approach rather than trying to train them out of a bad habit approach. These sound great for the little ones whilst potty training or if they're prone to bed-wetting accidents. I think they'd really help the little one not feel embarrassed. LOVE the camo print! Looks more like underwear too! He is so adorable. These are awesome and I love how the protect and look like real underwear too. Thanks for sharing. I love the camo pattern! We live in the country, so I know a lot of people who would love those for their kiddie! These are great. I have been looking at the the underwear. I think these are great for the transition period from diapers to being fully potty trained. I love the camo print! I don't have kids but these look great! Great post. I love that there is a good alternative for children who wet their beds. It's a normal thing but many children are shamed for doing it. I was pretty surprised at the percentage. My daughter has tried these as well. They work really good. I will keep this in mind as my son is potty training right now. My daughter didn't have this problem too much but I heard it is more common with boys. Love how they look like undies! Diapers seem to be looking less and less like diapers!